The map above illustrates the Top 10 Accident Hotspots on Snoqualmie Pass. Hotspots are represented by a red cross. Click in the upper right-hand corner for a larger view. Collision data courtesy of the Washington State Patrol. Snoqualmie Pass is the primary mountain pass that carries Interstate 90 through the Cascade Mountain Range in Washington state. On average, more than 20,000 vehicles cross over Snoqualmie Pass each day. During weekends, that number can surge up to 50,000. The traffic volume has increased by over 25 percent over the last five years and is predicted to continue to increase every year moving forward. A section of freeway in this area has been called the I-90 Danger Zone due to the extremely high number of motor vehicle collisions. The 42-mile stretch of Interstate 90 between the summit of Snoqualmie Pass and the Indian John Hill rest area east of Cle Elum has been labeled the I-90 Danger Zone due to the number of motor vehicle collisions and fatalities. The section extends from I-90 milepost 47, just west of the Kittitas County line, to milepost 89 outside Cle Elum. Davis Law Group conducted a detailed analysis of I-90 Danger Zone accident data from 2014, 2015, 2016, 2017 and 2018. We found that, on average, the highest number of collisions happened along the 2-mile stretch near mileposts 53 and 54. The report was recently featured on KOMO News (see image above), The Spokesman-Review and Patch.com. In 2014 there were 452 crashes in the I-90 Danger Zone; that number increased to 607 accidents by 2017. The yearly total dropped significantly in 2018 to 474. While an overwhelming majority of these collisions did not result in any injuries, there is still a need for increased safety on this part of Interstate 90. Year after year the same mileposts see a high number of crashes, and we hope this study plays a part in raising awareness. Milepost 53. With an average of more than 30 crashes per year, the this mile stretch of Snoqualmie Pass is the most dangerous area we looked at. After having just 17 accidents in 2014, this milepost has seen a spike in collisions since 2016. In the past three years, milepost 53 has seen 114 accidents, including 39 in 2018. Milepost 54. Coming in right behind milepost 53, milepost 54 averages 29.6 accidents per year. With a 40 percent increase since 2014, this area is the last mile as you head toward Keechelus Lake. Adjacent to milepost 53, this 2-mile stretch has about 60 accidents a year. Milepost 52. Along the long right-hand turn around Snoqualmie Pass, milepost 52 is the third-most dangerous spot on our I-90 Danger Zone. An average of 22.8 accidents occur on this stretch per year, though milepost 52 did have a 21.7 percent decrease in accidents over the five years we looked at. Milepost 51. Though milepost 51 saw an 14.3 percent decrease in wrecks from 2014-18, this stretch still sees 21.8 accidents a year on average. Milepost 88. Way on the other end of our Danger Zone, milepost 88 in Cle Elum is another hotspot to watch out for. About 22 accidents occur on this stretch every year, including 30 in 2015. The table below gives accident totals for all mileposts from 2014-18. 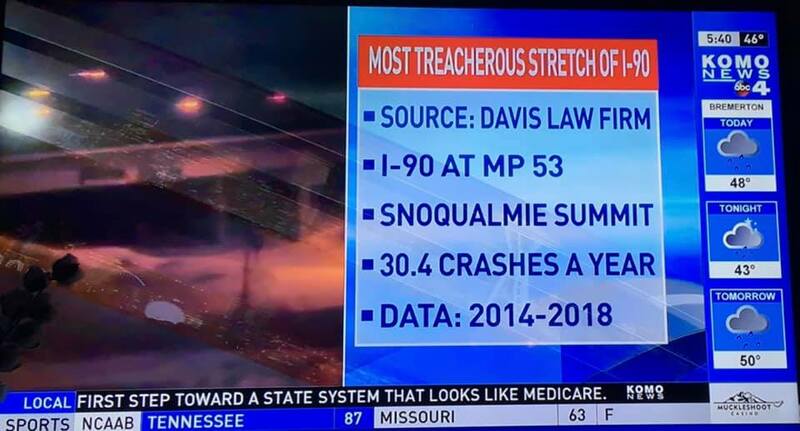 Why is Snoqualmie Pass So Dangerous? Semi trucks. Each year, 10 million freight trucks carrying $500 billion worth of interstate, import, and export goods move through Snoqualmie Pass on Interstate 90, according to WSDOT. Speeding. Snoqualmie Pass has a variable speed limit which changes due to weather conditions, construction projects, and other factors. Washington State Patrol data shows that during one two month period (June and July of 2016) troopers stopped almost 1,000 people for speeding in the I-90 danger zone. Speeding vehicles can easily lose control in this section of road that has steep inclines and multiple twists and turns. Construction projects. WSDOT has multiple construction projects extending from the North Bend Vicinity (mile posts 34-52) thru Snoqualmie Pass (mileposts 57-98) on to the Cle Elum Vicinity (milepost 87-97) and beyond to Ellensburg (milepost 134). These projects are designed to meet both the current and future needs of this transportation corridor. However, road construction narrows lanes, moves lane makers and adds obstacles which leads to an increase in accidents. Dangerous weather conditions.Mountain weather conditions during the winter are highly unpredictable. 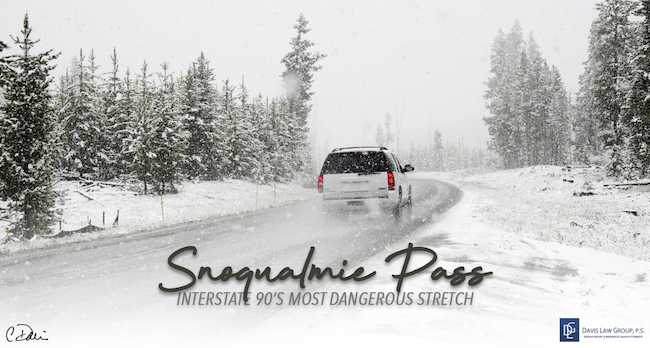 Freeway driving on Snoqualmie Pass in the winter is different from any other area of I-90. People who are not accustomed to driving in the snow can have problems during poor snowstorm visibility or deep icy inclines or curves. Depending on road conditions, the WSDOT may call for traction tires or tire chains to be used. Heavy traffic. The sheer volume of vehicles over the pass in any weather condition poses an increased risk for multi-vehicle accidents, with a greater potential for serious injury. Large traffic volumes on the pass speeds up the compacting of snow on the roadway. Compacted snow turns to ice and increases the risk of spinouts. 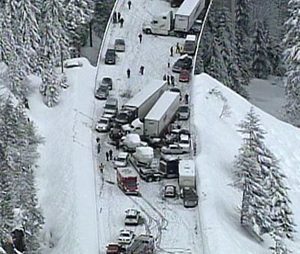 When vehicles are traveling closely together while climbing Snoqualmie Summit, a single wreck or truck jackknife can cause a major, multi-vehicle accident. Avalanches and rock slides. Avalanches, rock slides and wildlife activity can have a major impact on traffic flow across Snoqualmie Pass. Traffic Flow Management is a new tactic WSDOT is developing to keep the Snoqualmie Pass safe for travelers and open as much as possible. It is designed to regulate the number of vehicles per hour attempting to cross the pass. Traffic Flow Management will be implemented when snowfall and traffic volume combine to result in dangerous conditions at the summit of the Snoqualmie Pass. 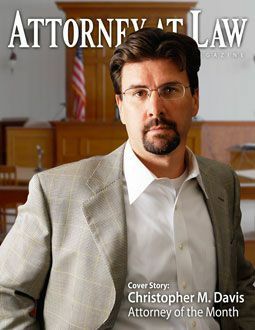 Award-winning attorney Chris Davis of Davis Law Group has been helping victims of Snoqualmie Pass accidents recover large injury and wrongful death settlements and verdicts for more than 20 years. You may have seen Mr. Davis on local or national news programs discussing the firm's high-profile cases or offering commentary on other legal issues. Davis Law Group has been named Best Injury Law Firm in Washington State in AI Global Media's Dispute Resolution Awards and 'Best Traffic Accident Firm' in Washington State by Legal Elite for commitment and excellence in serious motor accident claims. If you or a loved one has been seriously injured in a an accident on or near Snoqualmie Pass, the team at Davis Law Group at (206) 727-4000 to schedule your free legal consultation.